By General Crafts Contributor Erin from the blog Lovesome. My little guy had a birthday recently, and specifically requested that we have party hats on his big day. I hit up all the usual stores and all the party stores near us and could not find anything that I liked. So I decided to try making my own, and love how they turned out! 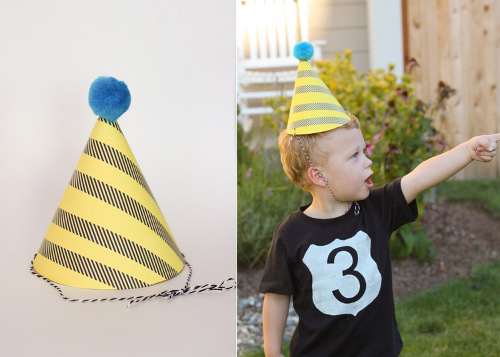 This is a quick project, and the result is custom, inexpensive, adorable party hats. 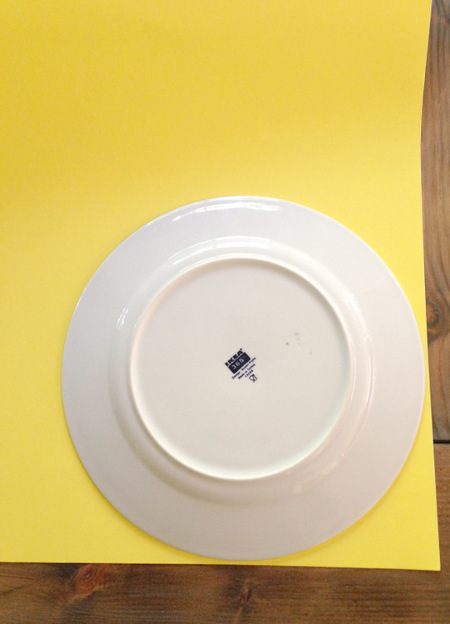 First, trace your plate onto your cardstock or poster board. One circle will make two party hats. Draw a line down the center of the circle, giving you two half-circles, and then cut out your two half-circles. 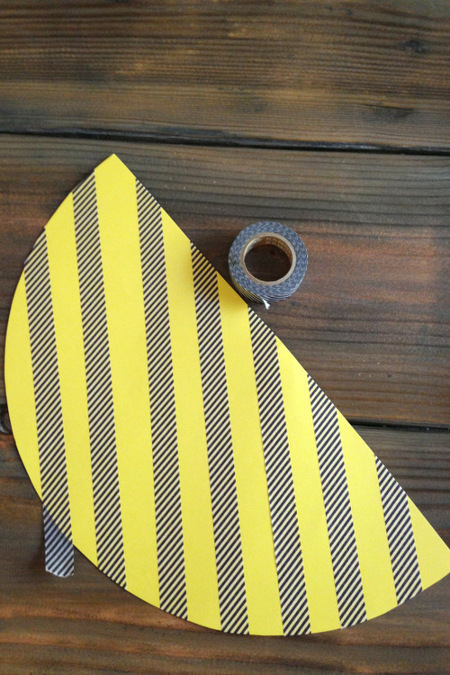 Decorate your half-circle.We had a little construction themed party, so I thought black and white stripes on yellow paper would be cute. Do what you like for your party, and include your kids if you want. Watercolor, fingerpaints, and stickers would be fun too! 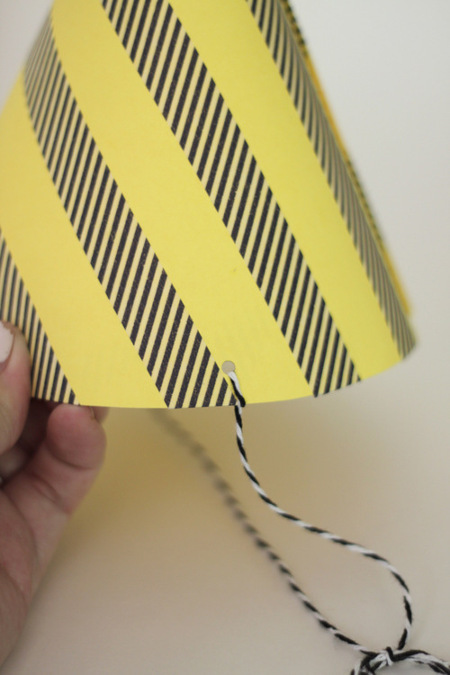 On the “wrong” side of the half-circle, put a strip of double-sided tape along the edge. A line of glue would work too. 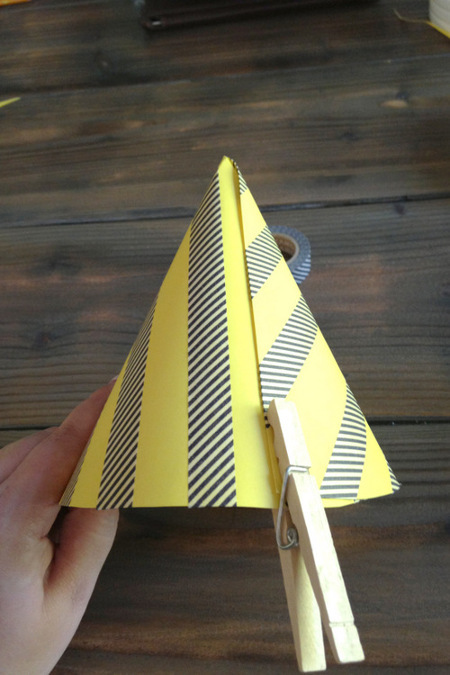 Fold your half-circle into a cone, bringing the corners together so the edges overlap, creating your party hat. You can determine the size of the party hat at this point. For a smaller hat, use more overlap, for a larger hat, overlap less. If you use glue, stick a clothespin over the seam to let it dry. Punch a hole on each side of the hat, about a half-inch above the bottom, and thread your string or elastic through each hole, tying tight knots to secure the string. Once the hat is on, you can tie a little bow under your chin to keep the hat from falling off. I topped my hat off by gluing a pom pom on top. I love the pop of blue and the added whimsy. Once the glue is dry, your hat is ready to party! Have fun! 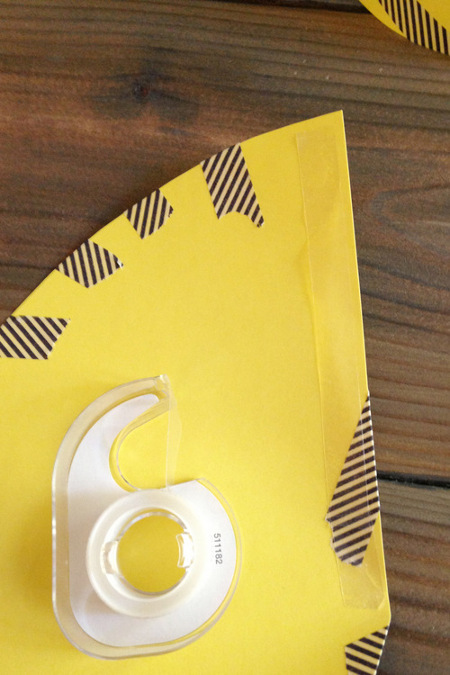 This entry was posted in Birthdays, Crafts, Kid's Crafts, Paper Crafts, Parties and tagged Crafts to Wear, Washi Tape on September 17, 2013 by erin. My name is Erin Lund and I share ideas and inspiration over at Lovesome (link: www.feelinglovesome.blogspot.com). I live in Seattle, Washington with my husband and toddler-son, and have grown to love the rain, it gives me extra time inside for crafting and creating! As a preschool-teacher-turned-mother I love coming up with kid-friendly crafts, as well as pretty little projects for myself that make life a little more fun. 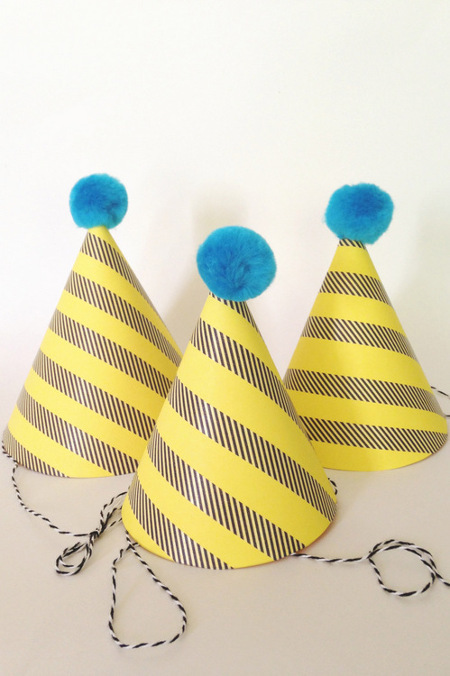 Pingback: Make a Party Hat | Addicted 2 Fun: Interesting Pictures, Inspiration , Quotes & Content that Matters!